The biggest frog in Australia just woke up, and he is very thirsty!After he drinks all the water in the ground and the sky, there isn't any left for the other animals. The other animals now have to come up with a plan to get the water out of the frog! 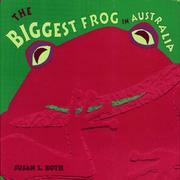 Roth, Susan L., “Biggest frog in australia,” Children's Picture Book Database at Miami University, accessed April 24, 2019, https://dlp.lib.miamioh.edu/picturebook/items/show/5939.